Are You Ready to Throw Out All Those Boring Language Textbooks, Workbooks, and Dictionaries? Then you're ready for IdiomaX Translation Suite 7.0. Once you have downloaded and begun using this comprehensive suite of translation software, your colleagues, boss, family and friends will marvel at your newfound confidence and language proficiency. You'll discover that it actually can be fun and not a chore to learn new languages like Italian, Spanish, French and German... and to have instant translation of words, sentences and whole documents right at your fingertips. Imagine how it will change your work life, your communications with friends far away, and your ability to meet new people! Read and send emails in other languages! Now you can forge a powerful connection with your co-worker at the plant in Mexico, your supplier in Paris, or a travel acquaintance in Heidelberg. Fast and accurate email conversations in real time are now possible. Translate the web... the whole, world wide web. English dominates the Internet but with the Translation Suite, speakers of other languages have a tool to convert webpages and gain access to more information than ever before. This could revolutionize the way you and the world use the web. Translate any MS Office program you're using: Word documents, Excel spreadsheets, PowerPoint slide shows, databases and much more. Our translation software was created for Microsoft Office so the compatibility is complete. Translate longer documents. You get more than a choppy, word-by-word translation. Our intelligent translation software acknowledges the finer points of language like idiomatic expressions, syntax, grammar, and conjugation so there's less fine tuning needed to achieve perfection. Translate snippets of text instantly. The translation assistant is always at the ready for when you need quick look-up of an individual word or phrase. A great tool for intermediate language users. 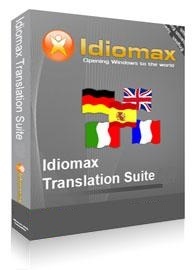 IdiomaX Translation Suite 7.0 is Now Only $59.95 USD (Regular $59.95 USD) Buy the IdiomaX Translation Suite today and you will receive the IdiomaX Dictionary ($49.95 worth) absolutely FREE. With more than 200,000 words and phrases, now you really can chuck your books! The revolutionary IdiomaX Mobile Translator. It downloads easily onto your SmartPhone or Pocket PC and goes wherever you do. Stuck for a word or phrase when you're stuck in traffic? Need to translate an email at the lake or a document on a business trip? Mobile Translator is as close and convenient as your cell phone. Special Price Offer: You get 10% off the Mobile Translator when purchased with the IdiomaX Translation Suite. Check here now to include "IdiomaX Mobile Translator" with your order IdiomaX Translation Suite and claim your HUGE 10% discount available to Translation Suite customers ONLY!